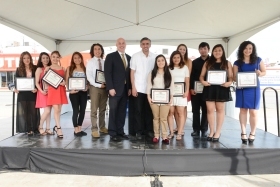 Local car dealer, Car Outlet, announced the ten students receiving $1,500 scholarships towards their education related expenses in the 2014/2015 academic year. The students were selected from a large pool of applicants from across the region and were chosen by a distinguished review committee based on: GPA, letters of recommendation and their personal stories of hardship and dreams of a better future. The students and their families were honored at a special breakfast at a Car Outlet location on August 7, 2014. The students from Chicago neighborhoods and suburbs including Little Village, Pilsen, Back of the Yards, Waukegan and Wheeling are all headed to colleges and universities around the country this fall. The scholarship program will continue in 2015, and applications will be accepted beginning December 2014 at www.drivingsucceessscholarship.com.